While at your appointment, we will give you instructions for supplemental ideas to promote healthy feelings and accelerate healing. We offer you these tools to help you be successful, and they are designed to enhance your laser therapy experience. We also want to improve your chances at long-term success and help you avoid ever wanting a cigarette again. Each area will be targeted for a total of 30 seconds. How Does the Treatment Work with a Chiro In Pelham? You will feel the effects of the laser smoking treatment throughout the four to six week physical withdrawal period. How Many Visits Will You Need With Your Pelham Chiropractor? Only a single, one-hour visit is necessary to quit smoking with our laser treatment. You are encouraged to return for a second visit, within eight weeks if uncontrollable cravings or feelings surface after your initial appointment. This visit will re-stimulate the release of the calming neuro-chemicals to keep you on the course and help you stay away from cigarettes. It is vital that you understand that this follow-up appointment is only effective if you HAVE NOT smoked since your first visit. If you find that you need additional help after the second visit, booster visits are available. Can the Laser Therapy Work For Chewing Tobacco? What Does Laser Therapy Cost with Your Pelham Chiro? To find out the cost of the laser treatment and to see if we are currently running any promotions, contact our office today. Will You Gain Weight After Laser Therapy For Smoking? If you are concerned about gaining weight after you quit smoking, you can try our laser therapy for weight loss as well. You can add this treatment on if you are interested and it was designed to optimize the metabolic rate and suppress your appetite, even while quitting smoking. What Happens If You Relapse After Treatment? If you experience a setback by smoking a cigarette following your treatment, another full laser smoking treatment will be needed. This is why you will be encouraged to return for a follow-up appointment so that you can avoid relapsing in the beginning. 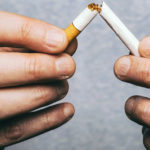 Will Treatment Work If You Do Not Want To Quit Smoking? You will not want to invest in laser therapy unless you actually want to stop smoking. 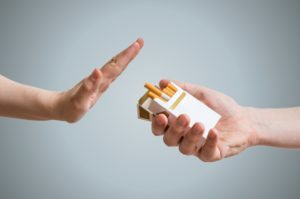 While some clients who not have a sincere commitment to quit have are successful, we do not want you to chance relapsing because you are not ready to quit. We recommend waiting until you are willing to stop before you come to our office for laser stop smoking treatment. The laser stop smoking treatment at our office is completely painless. In addition to that, the treatment does not have any known negative side effects at all. In fact, you will not feel a thing during your treatment. The most that you will feel is a gentle pressure from the laser probe against your skin in the areas that we mentioned above. Why Should I Choose McKenna Family Chiropractic? We have been offering laser programs to quit smoking for a long time. The satisfaction of our customers and their referrals speak to the quality and reputation of our program along with our other services that we provide at our Pelham Chiropractor Clinic. Newer post: Consider Chiropractic Care in Pelham and Biofeedback To Treat Your Migraines!